By now, you’ve probably heard about the Vampire Facial and how this revolutionary procedure has taken the cosmetic and aesthetic industry by storm. In previous blogs and during live demonstrations, we’ve taken the time to answer your questions and explain the powerful science behind this treatment. Seiler Skin was one of the first practices in Birmingham to offer this procedure, and over time we have perfected our approach and uncovered what is required to deliver incredible results that truly last. Today, I wanted to spend a few minutes discussing why we now know that when it comes to the Vampire Facial, “three” really is the magic number. 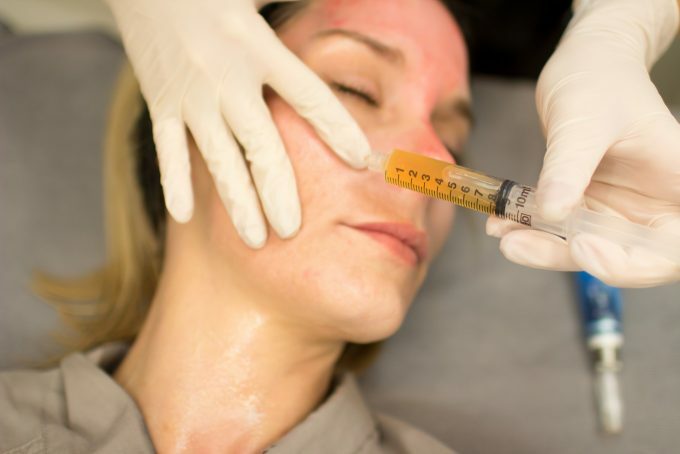 But first, a quick recap for anyone who wants a refresher – the Vampire Facial is a painless, minimal-downtime treatment that uses medical microneedling to deliver platelet rich plasma (PRP) directly into the skin. PRP is a concentrated source of platelets containing growth factors found naturally in the body that help stimulate and control the body’s healthy regenerative processes. During treatment, we apply PRP topically onto the face, neck, chest and other areas of the body to promote soft tissue remodeling that produces a more youthful looking, radiant appearance. The Vampire Facial is also great for addressing an array of skin concerns, such as fine lines, uneven texture, acne/acne scars, age-related skin dullness and even stretch marks. Now, you may be asking yourself, “Why would I need three treatments if I can see results after just one?” While patients do experience an improvement in skin complexion and texture immediately after treatment, over the years we have observed and proven that a series of three Vampire Facials produces the best long-term results. Think of it this way – many of the concerns we can treat effectively with the Vampire Facial, such as acne scarring, fine lines and skin dullness, take years to form. More complex issues that have advanced to a certain degree simply require more time and attention to fully correct, as the skin must be reconditioned to begin healing. Each treatment in the three-part series helps your skin achieve optimal results in different ways. The first Vampire Facial creates a “blank slate” for us to work with, clearing your skin of the “debris” that builds up over time. This initial treatment also kickstarts the natural development of collagen, which creates a fuller, more youthful appearance. During the second treatment, which is performed three to six weeks after the first, we’re able to be more aggressive because the skin has already been exposed to microneedling once before and is better able to absorb the PRP. After an additional three to six weeks has passed, we perform the third treatment in the series, effectively sealing in the results of the previous two treatments. By this point, a patient’s skin has built up a strong resistance to redness and peeling, further decreasing the already minimal downtime and producing optimal results more quickly. We tell patients all the time that visiting Seiler Skin isn’t just about treating their immediate skin concerns – it’s an investment in their long-term skin health. The experience we provide can’t be beat (ask around or read some of our reviews! ), and makes the difference between short-term improvements and lasting results. The Vampire Facial truly is a transformative procedure that can help people address some of their biggest skin concerns, especially when paired with the right pre- and post-treatment products such as TriHex Transition Duo from Alastin Skincare. This product clears skin debris prior to treatment in order for optimal absorption of the PRP, and then helps rebuild and replenish skin from the inside out post-treatment to obtain long-lasting results. Remember – when it comes to the Vampire Facial, three is the magic number! So, are you ready to schedule your appointment and begin your journey toward healthier, more youthful skin? We’re here to help!